Sparrow Wallpaper is another photo wallpaper of Sparrow. We posted another Sparrow photo wallpaper ago, this is a set containing various resolutions of wallpaper. This sparrow wallpaper set is from MITARI. Mitari is contributer of our group since the first day. It is a RAR download, the file is 9 MB in size. Sky Flower Abstract Wallpaper is an excellent quality high resolution abstract vector wallpaper of a colorful flower. Clouds Wallpaper is a digitally created Wallpaper in Photoshop using cloud brush. 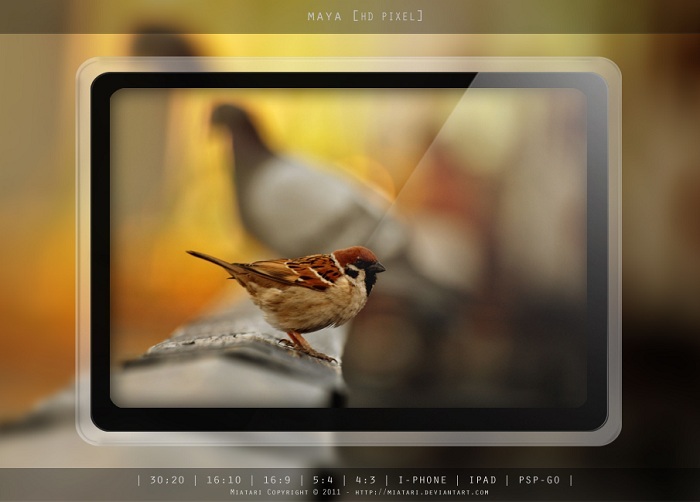 Cite this article as: Abhishek Ghosh, "Sparrow Wallpaper set for your Windows PC,Mac,PSP,iPad,iPhone," in The Customize Windows, September 6, 2011, April 25, 2019, https://thecustomizewindows.com/2011/09/sparrow-wallpaper-set-for-your-windows-pcmacpspipadiphone/.